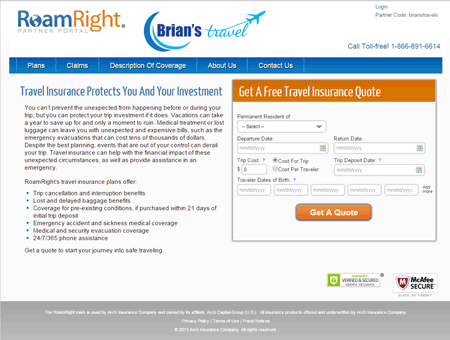 As a RoamRight partner, you can choose to have your own website to sell travel insurance. This website is cobranded with your logo and messaging. You earn a commission* while your clients purchase insurance directly from us. Your clients can obtain their own travel insurance quote, purchase their own individual policies, find out about filing a claim, and contact RoamRight directly. View a sample website. * Your Regional Sales Representative will work with you to determine if licensing is required in order to earn commissions. Watch this video to learn more, or download the RoamRight App from the App Storeor Google Play. Your travelers can have the latest travel information at the tips of their fingers when they use the RoamRight mobile app. With a RoamRight username and password, your travelers can access all of the features in this free app. Watch this short video for a quick overview of the RoamRight app. 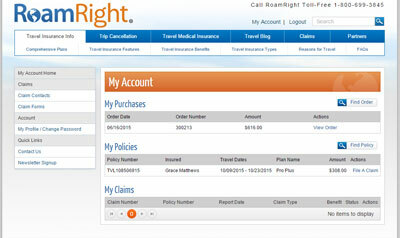 When your travelers purchase a RoamRight policy, they will have access to the My Account section of the RoamRight website. This password-protected site gives them the ability to view their policy details, start a travel insurance claim online, and much more.